The 2058 Flat Back crystals, Swarovski Xilion Rose cut Flatback Rhinestone features 14 alternating facets and a small table top. The SS9 2058 Flatback Rhinestones are available in a full factory package of 10 gross (1,440 pieces). 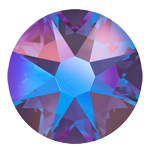 Swarovski 2058 rhinestones are produced in sizes from SS5 to SS10. Sizes SS12 and up are made exclusively in the 2088 Xirius Rose cut. The crystals' small nature is excellent for creating intricate designs. They can be glued to various materials such as fabrics, wood, metal and plastic. They are extremely popular in nail art. However, they are used in many industries for costumes, dance, skating, equestrian, show clothes, crafts to enhance small or high-detail work and embroidery. Swarovski 2058 Xilion Flatback Rhinestones are made of "Advanced Crystal" and are lead free* and compliant with international standards. Approximately 2.60mm - 2.70mm, allowing for a slight variance.